During the darkest days of the Civil War, wicked cutthroats came into possession of six pistols of otherworldly power. In time the Sixth Gun, the most dangerous of the weapons, vanished. When the gun surfaces in the hands of an innocent girl, dark forces reawaken. Vile men thought long dead set their sights on retrieving the gun and killing the girl. Only Drake Sinclair, a gunfighter with a shadowy past, stand in their way. I'm not sure how I stumbled upon this particular title. Probably a Goodreads recommendation, but I've been enjoying the first three volumes and have the next three waiting for me at home. There's a nice mix of history, the feeling of the wild west, and an interesting tale of the supernatural. Drake Sinclair is a force to be reckoned with. Not quite good but not quite bad. But he knows how to take care of himself which makes him so much fun. At first I was afraid that Becky, the innocent girl, would be a terrible stereotype of the damsel in distress, but she quickly proves herself to be a stubborn, frightful, resilient fighter who can hold her own against the forces of evil that are chasing her down. Olliander Bedford Hume, the original owner of Becky's new gun, is coming for her with his paranormal posse who have been warped by the power of the weapons. 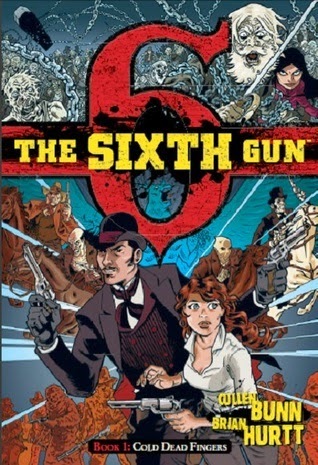 The Sixth Gun is another great option if you want a break from superhero graphic novels. Each volume is a quick read and there's enough intrigue and action to keep you invested.